Located in the heart of a land of budding investment opportunities, this modern townhouse is for the beach junkie. 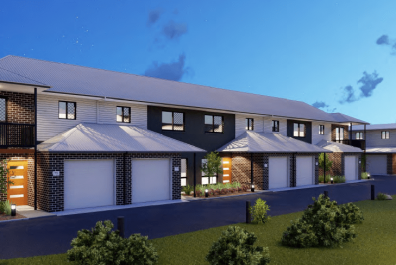 A contemporarily built house that is only a short drive away from the bright and colourful Sunshine Coastline of Queensland poses as a great option for a spectacular family home. Exciting prospects are on offer for everyone – over a dozen learning hubs in the 20km radius, 200 KMs of bikeways, investment avenues and brilliant connectivity to the dining scene. And with such affordable prices on offer at PhoneHomes, what’s the hold-up? Over 200 KM bikeways and walking paths are going to be encircling it, this gorgeous location is perfect for the adrenaline junkie. It’s so close to the beach that you would not be missing out on all those fun beach parties. Or maybe it is the relaxation and tranquility you seek. Water activities for the whole family coupled with adventure sports are the perfect ways to maintain a fit and healthy lifestyle. The suburb’s parks and greenery will surely be the draw for both young children and the elderly. A fun and adventurous lifestyle awaits at the Aura Terraces. The 3-bedroom residence oozes class and elegance in every square inch. Right from the interesting brickwork to the picturesque stain finish – you’ve got a finely furnished home that truly utilizes its space for the maximum comfort of the residents. The living room craftily incorporates the kitchen and the dining area while leaving ample space for the garage. The biggest of the three bedrooms is also attached to the uber spacious balcony that will surely be your favorite spot to enjoy a quiet evening in. But the architecture never compromises security for the style. Every item and fitting is such that can withstand the worse – be it the 20mm bench tops in both the bathrooms and the kitchen or the laminated finish or the durability offered by the ceramic tiling. 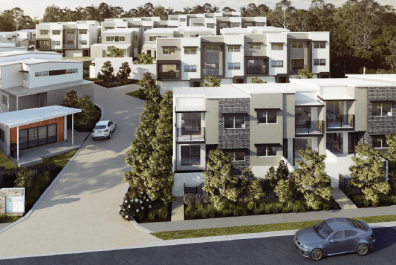 Rapidly developing as one of Queensland’s most vibrant new community, Aura Terraces is laden with exciting new avenues for the ones looking to invest. With the happening seashores being the primary attraction, the green and quiet suburbs make it a desirable destination for the young and old alike. The lovely village atmosphere is also an instant sell. So are the water and sports activities on offer. You can expect both the property as well as rental rates to go up in the near future. 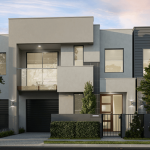 Do not miss out on the opportunity to seize one of the best prime locations in a budding new community. Contemporary townhouse in a peaceful location. A short drive away from the stunning Sunshine Coastline. Abundance of sports – water activities and biking – for the adrenaline junkies.